This is the black version of a detachment patch created for HSC-28, Det-1. 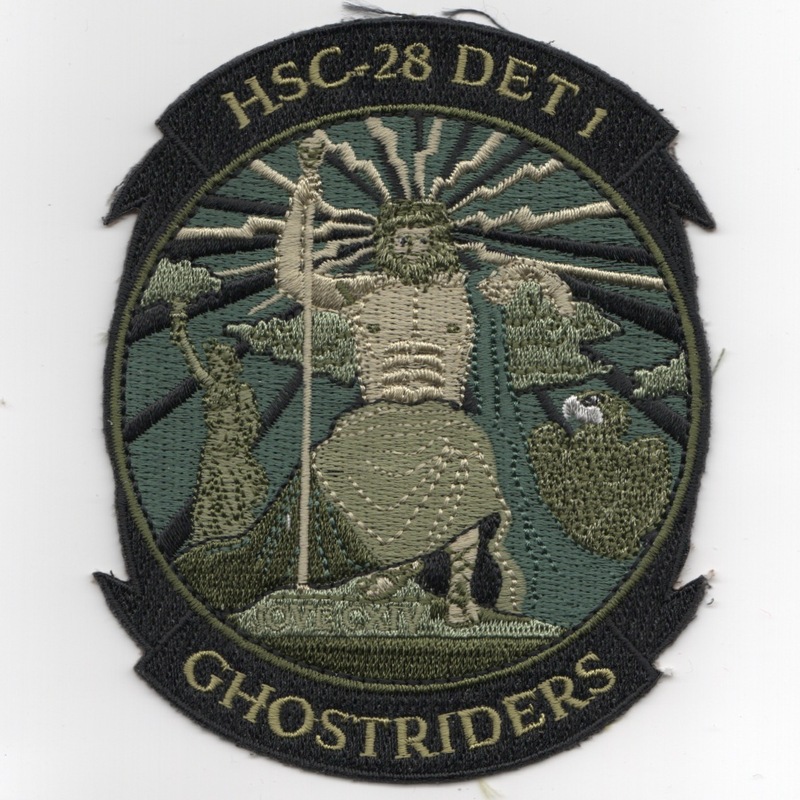 It says "GHOSTRIDERS" along the bottom and shows a Skull with a Cowboy Hat and Pistol. This patch does not come with velcro attached. 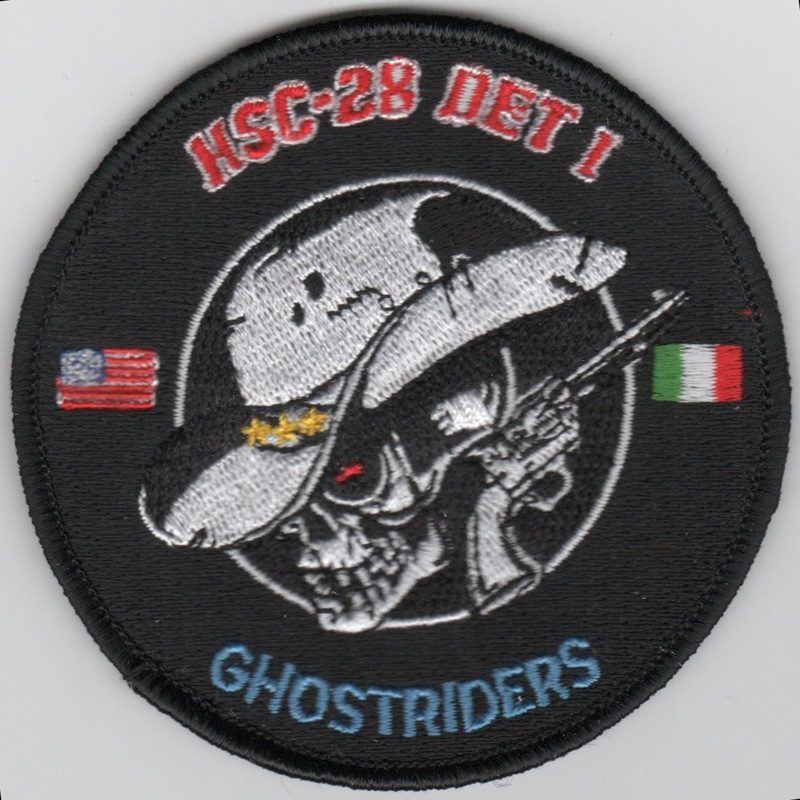 This version of the HSC-28 DET-1 'GHOSTRIDERS' patch shows the MH-60S with an American Flag backgroud at the top with the Octopus and Grim Reaper with an Italian Flag background. At the bottom, it says "NAPLES, ITALY". 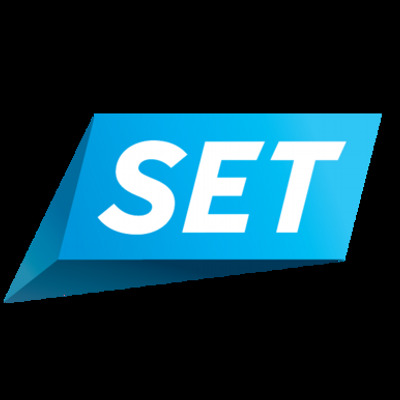 Some DETS are harder than others! This patch does not come with velcro attached. 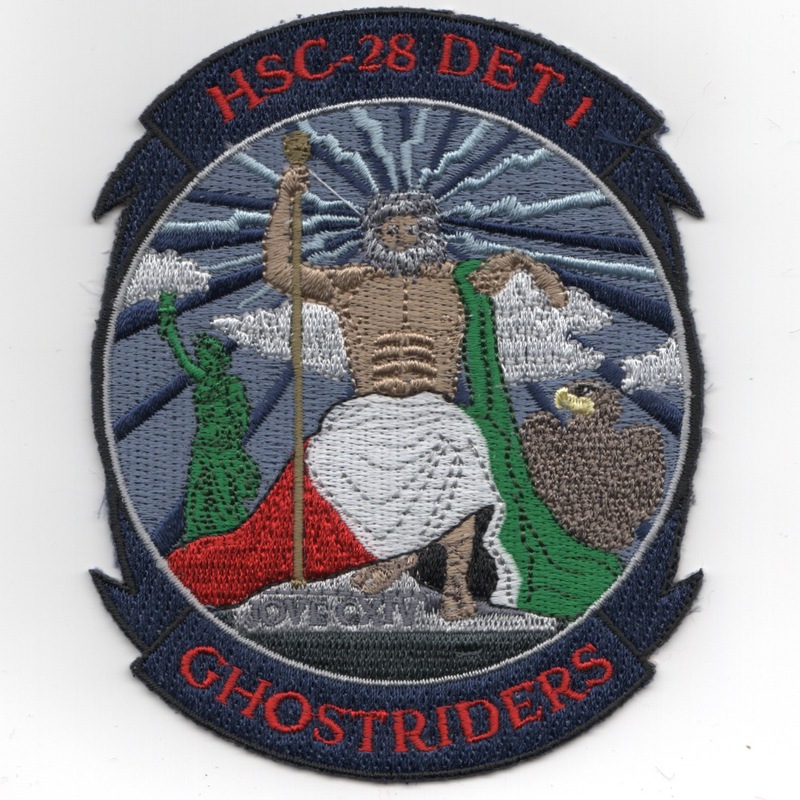 This is the dark blue/gray version of the HSC-28 DET-1 'GHOSTRIDERS' patch shows 'ZEUS', the god of SKY and THUNDER, with the ITALIAN flag draped over him and the Statue of Liberty and American Eagle either side of him. This patch does not come with velcro attached. 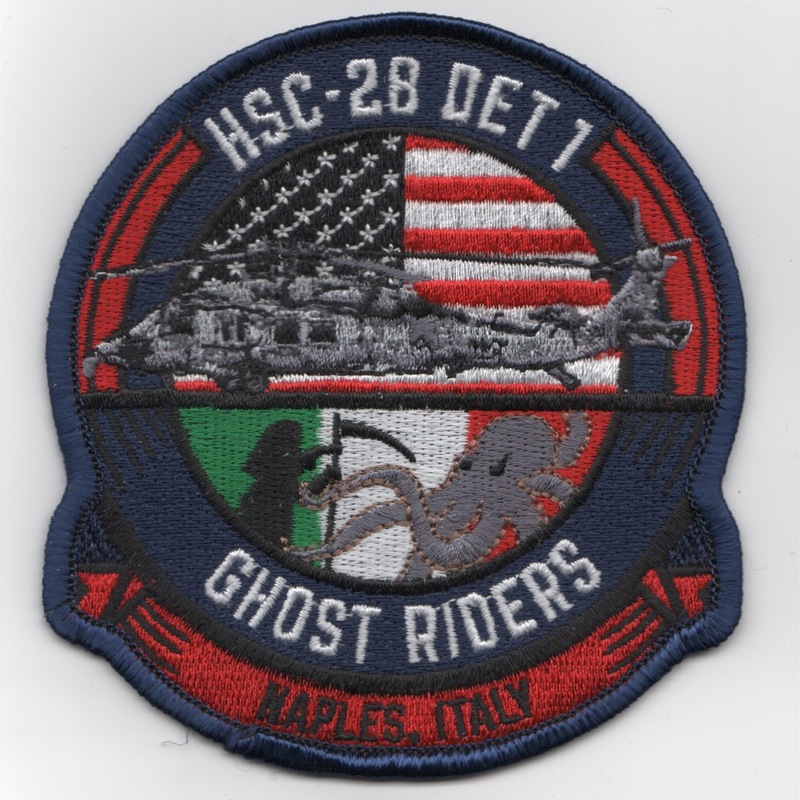 This is the OCP/Black version of the HSC-28 DET-1 'GHOSTRIDERS' patch that shows 'ZEUS', the god of SKY and THUNDER, with the (subdued version of) ITALIAN flag draped over him and the Statue of Liberty and American Eagle either side of him. This patch does not come with velcro attached. 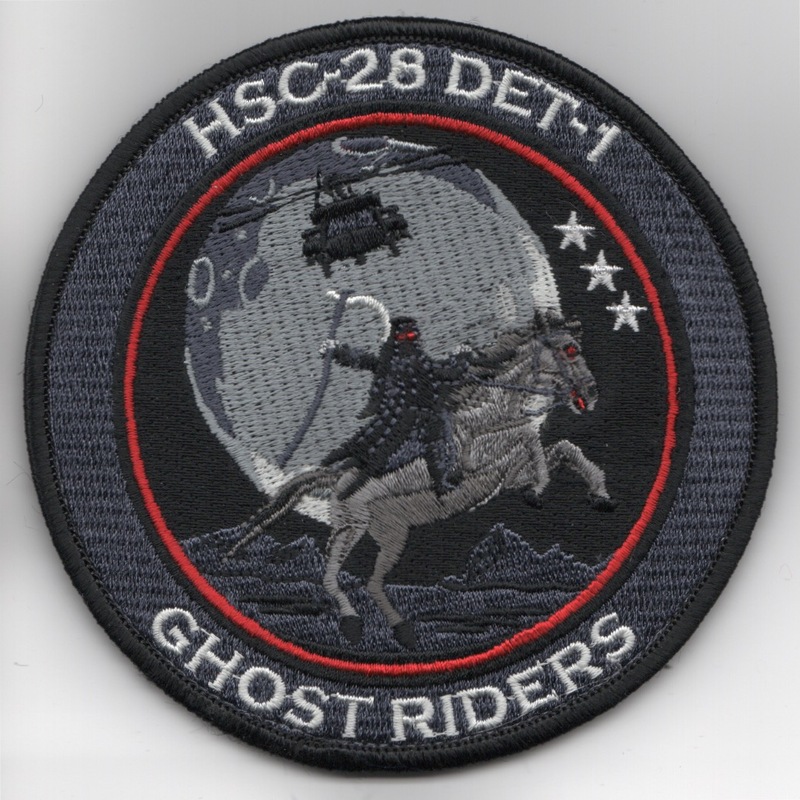 This is the black/gray version of the HSC-28 DET-1 'GHOSTRIDERS' patch that shows 'Horse-n-Moon' with their helicopter approaching. The 'Grim Reaper' is riding the horse. This patch does not come with velcro attached. 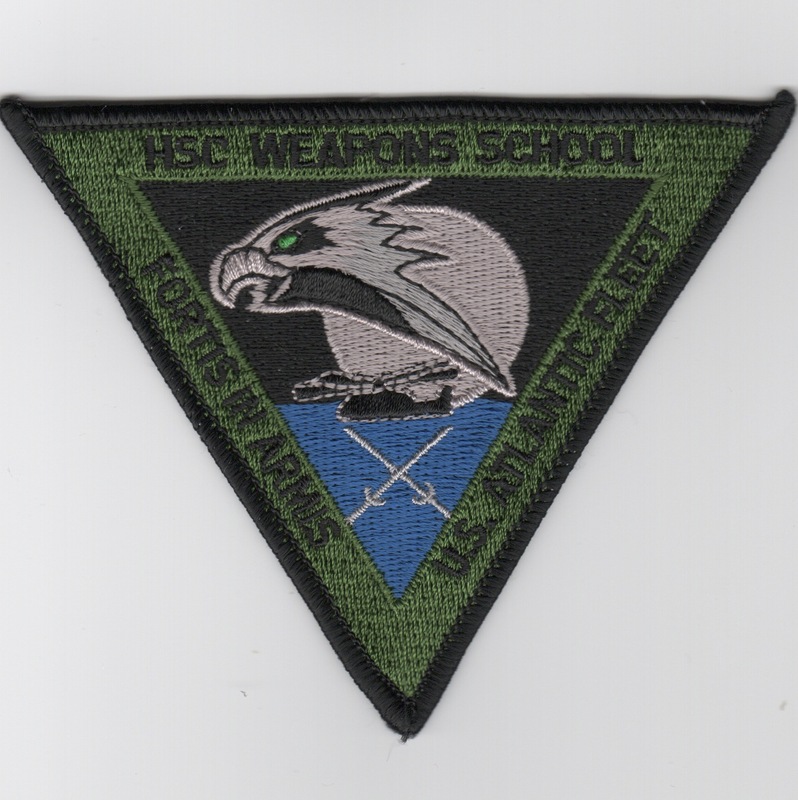 This is a detachment patch created for HSC-28, Det-3. 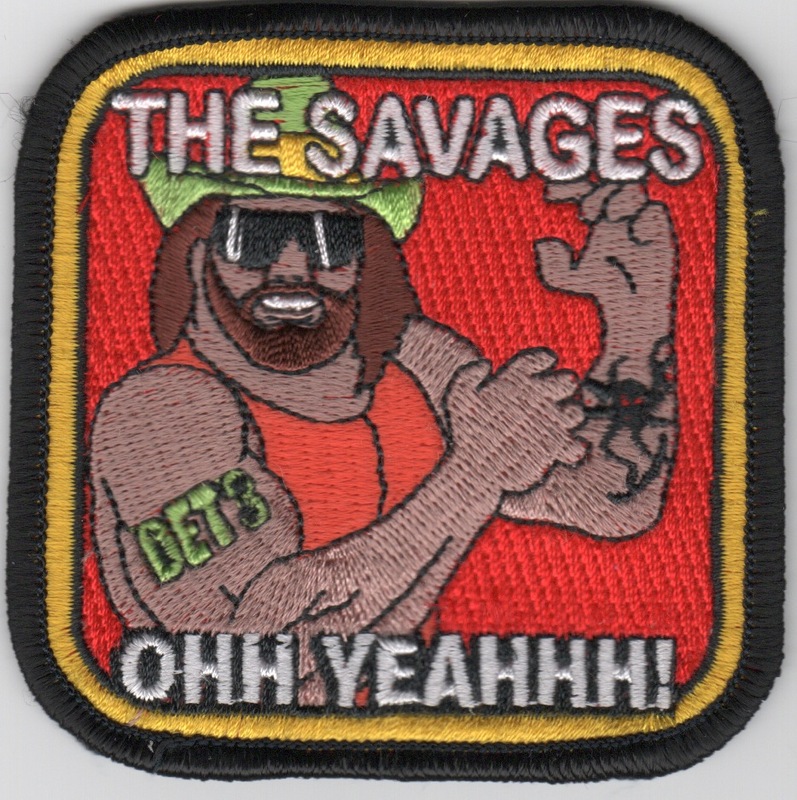 It says "THE SAVAGES" across the top, states "OHH YEAHHH!" across the bottom, and shows the infamous Randy, the "Macho Man" Savage in the middle. 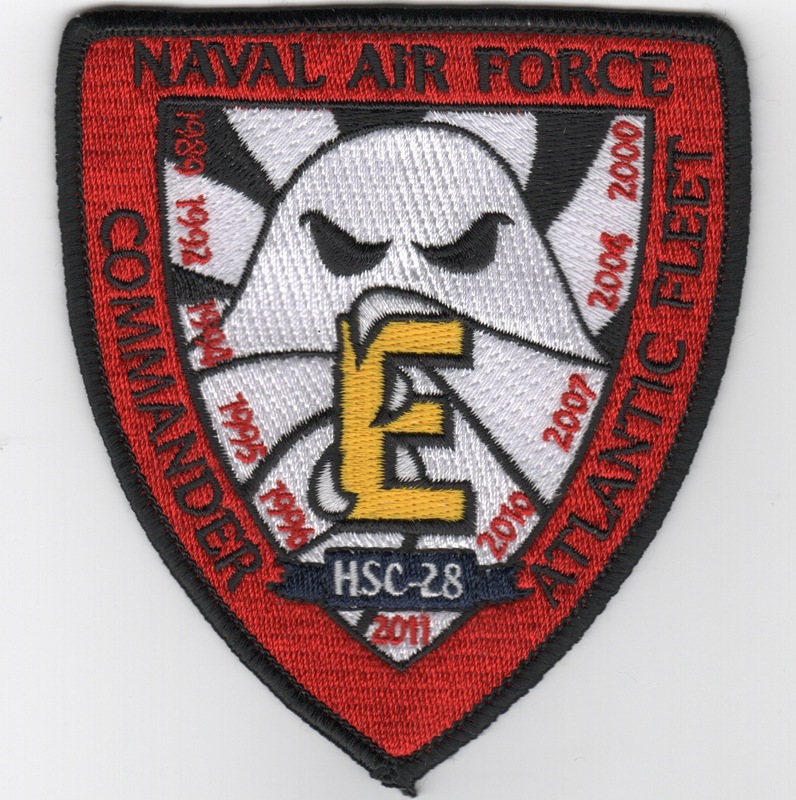 This is a detachment patch created for HSC-28, Det-3. 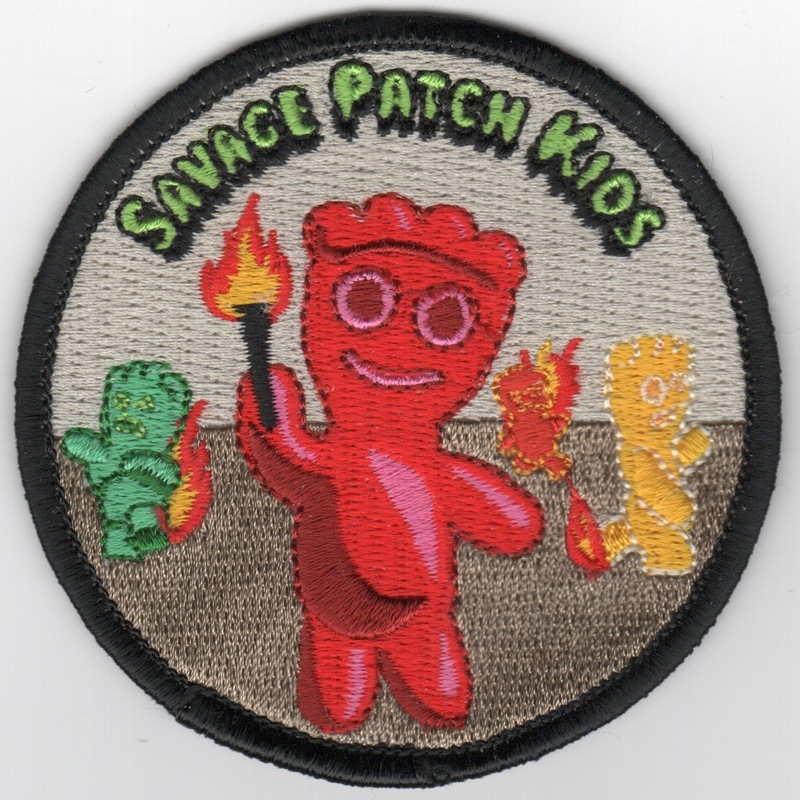 It says "SAVAGE PATCH KIDS" across the top and shows three of those "characters" (of which I'm not familiar) dancing with a match or on fire!! This patch does not come with velcro attached. 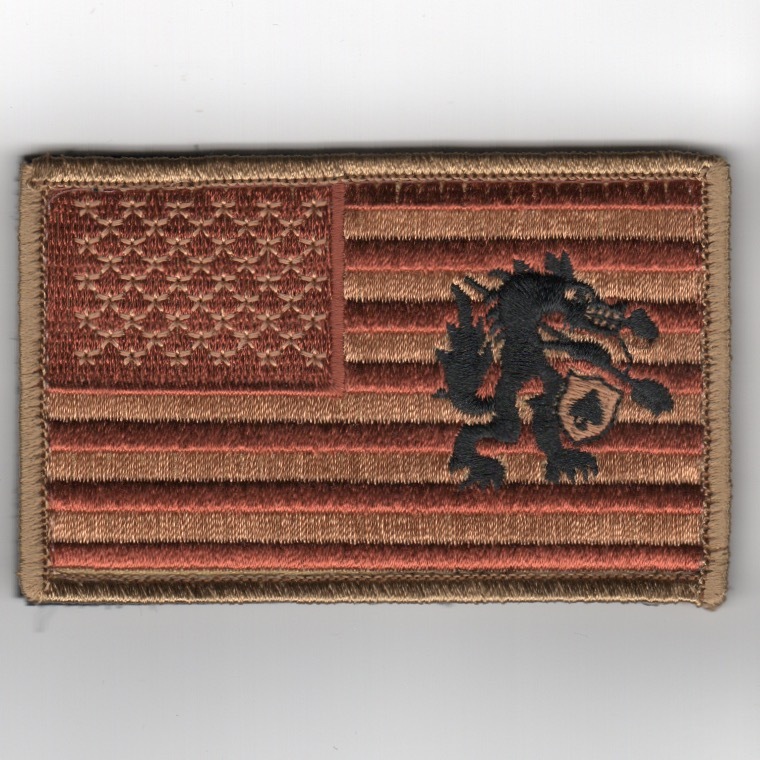 This is a desert-colored detachment patch created for HSC-28, Det-4. 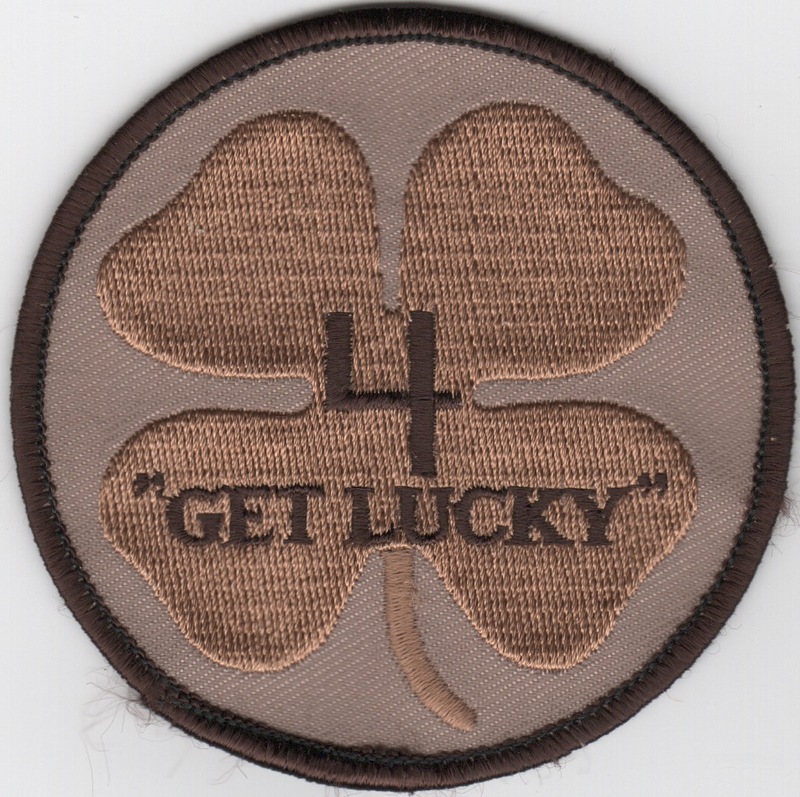 It shows a 4-leaf clover with the Det number and the words "Get Lucky" at the bottom. 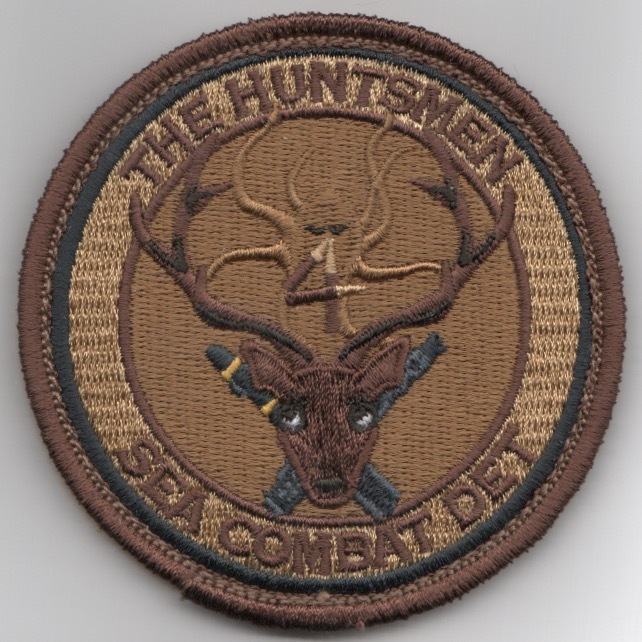 Another AV8RSTUFF creation for the HSC-28/Det-4 'HUNTSMAN' patch depicting a "MALE" deer. Behind the antlers, you can barely detect the "octopus" (their logo) and the patch says "SEA COMBAT DET" along the bottom. This patch does come with velcro attached. 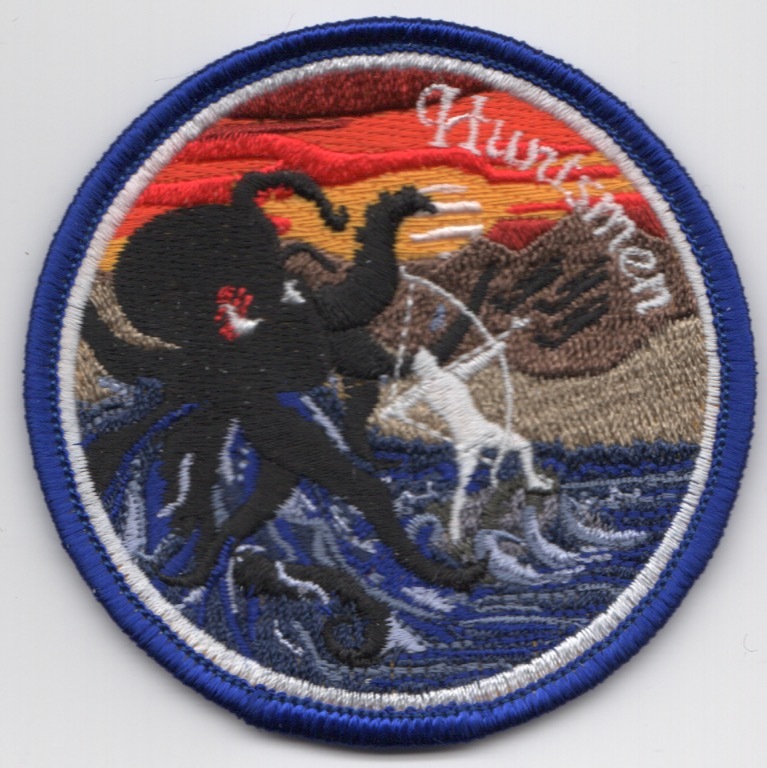 Another AV8RSTUFF creation for the HSC-28/Det-4 'HUNTSMAN' patch depicting a "FEMALE" deer. Behind the antlers, you can barely detect the "octopus" (their logo) and the patch says "SEA COMBAT DET" along the bottom. This patch does come with velcro attached. 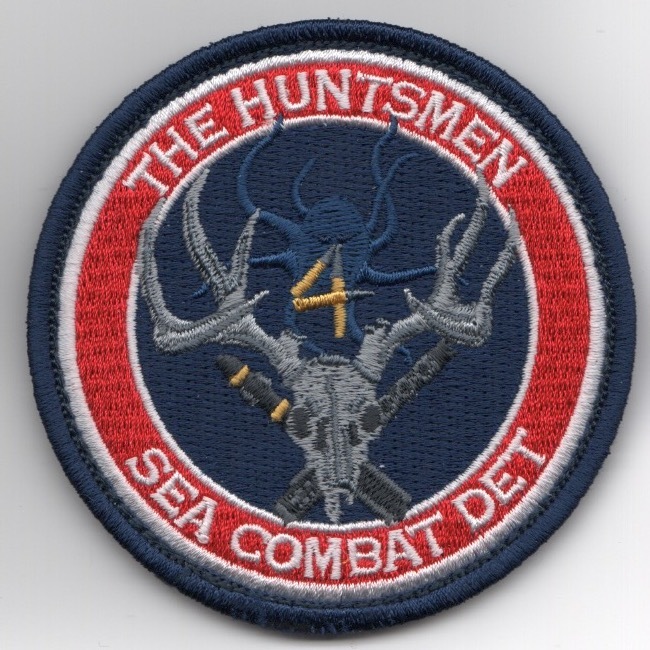 Use this link to get both "HUNTSMAN" patches listed above at a discount. 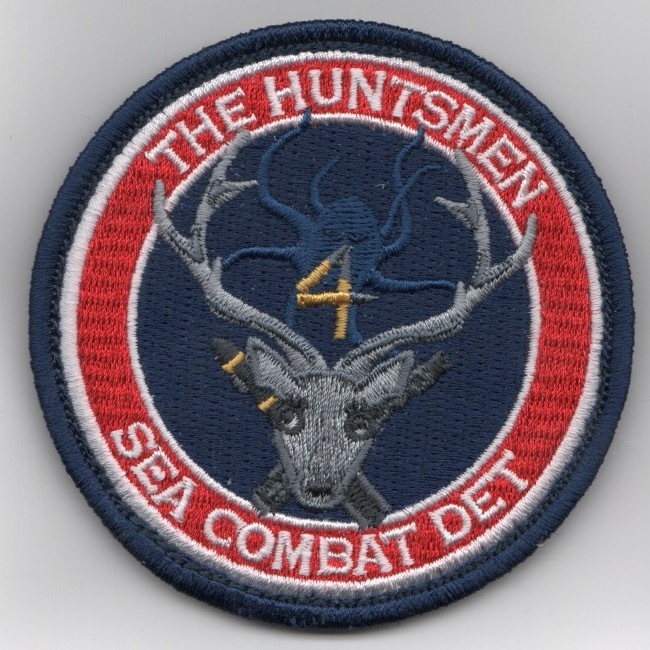 Another AV8RSTUFF creation for the HSC-28/Det-4 'HUNTSMAN' patch depicting a "MALE" deer. Behind the antlers, you can barely detect the "octopus" (their logo) and the patch says "SEA COMBAT DET" along the bottom. This is the desert version of their "HUNTSMEN" patch does come with velcro attached. Another AV8RSTUFF creation for the HSC-28/Det-4 'HUNTSMAN' patch depicting a "FEMALE" deer. Behind the antlers, you can barely detect the "octopus" (their logo) and the patch says "SEA COMBAT DET" along the bottom. This is the desert version of their "HUNTSMEN" patch does come with velcro attached. Use this link to get both of the desert version of the "HUNTSMAN" patches listed above at a discount. 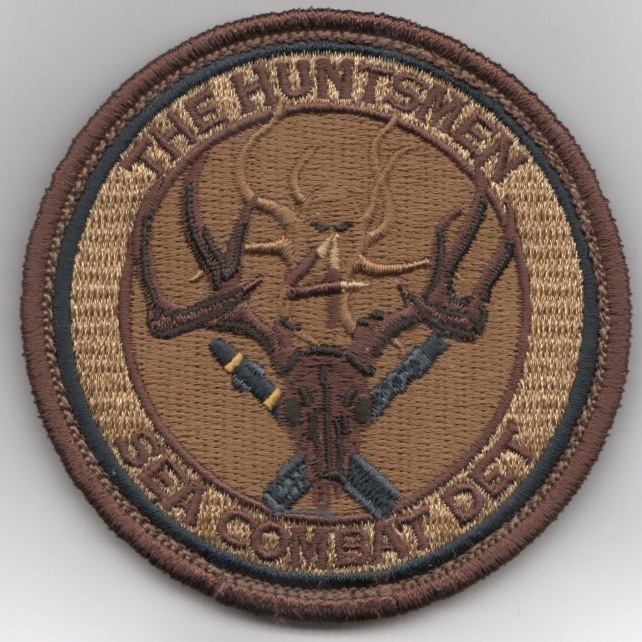 Another AV8RSTUFF creation for the HSC-28/Det-4 'HUNTSMAN' patch depicting a "MALE" deer. Behind the antlers, you can barely detect the "octopus" (their logo) and the patch says "SEA COMBAT DET" along the bottom. 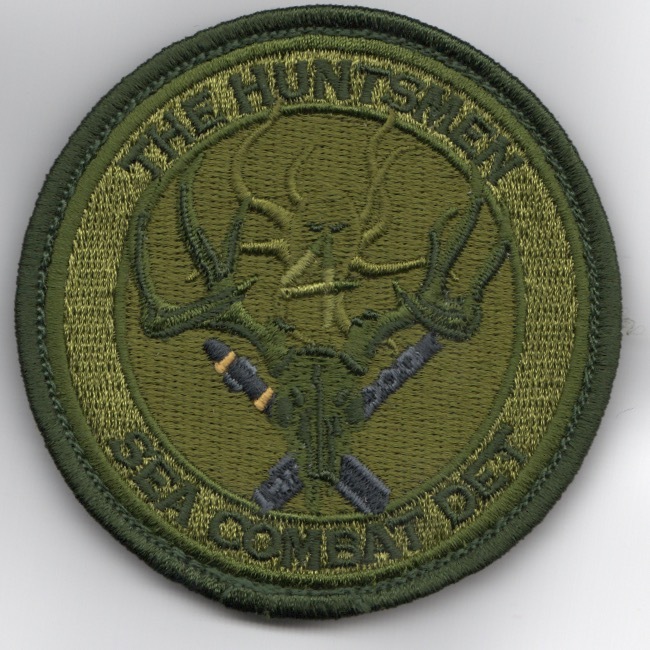 This is the OD green version of their "HUNTSMEN" patch does come with velcro attached. This is a detachment patch created for HSC-28, Det-5. 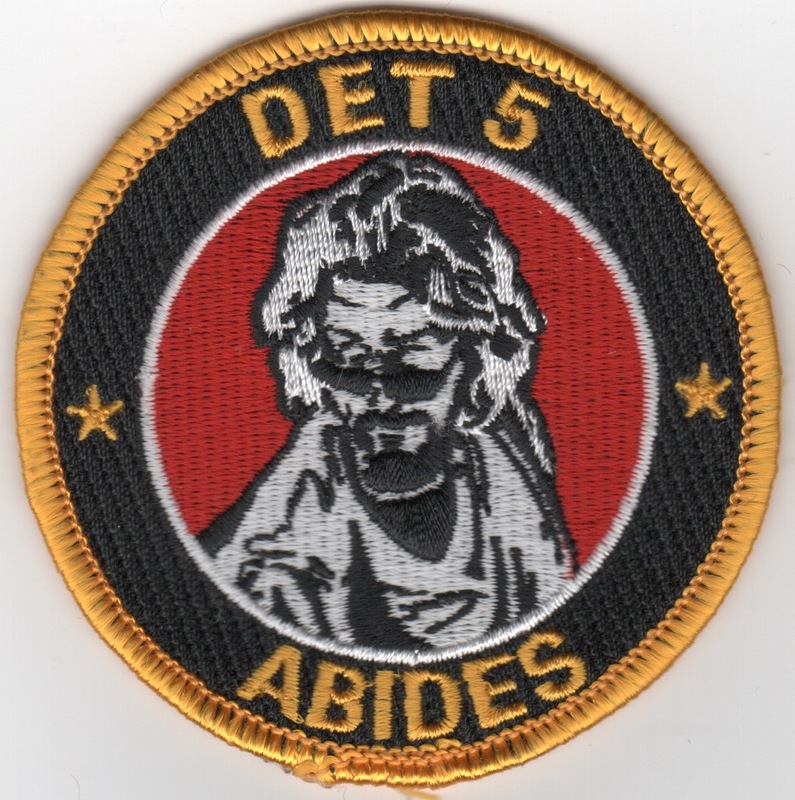 It says "DET 5" across the top, "ABIDES" along the bottom with a picture of what looks like Kris Kristoferrson (to me). This is a detachment patch created for HSC-28, Det-5. It says "VOODOO FLYERS" across the top, with the date May 2014 in the middle and a skull/crown in the middle. This is subdued version of the detachment patch created for HSC-28, Det-5. 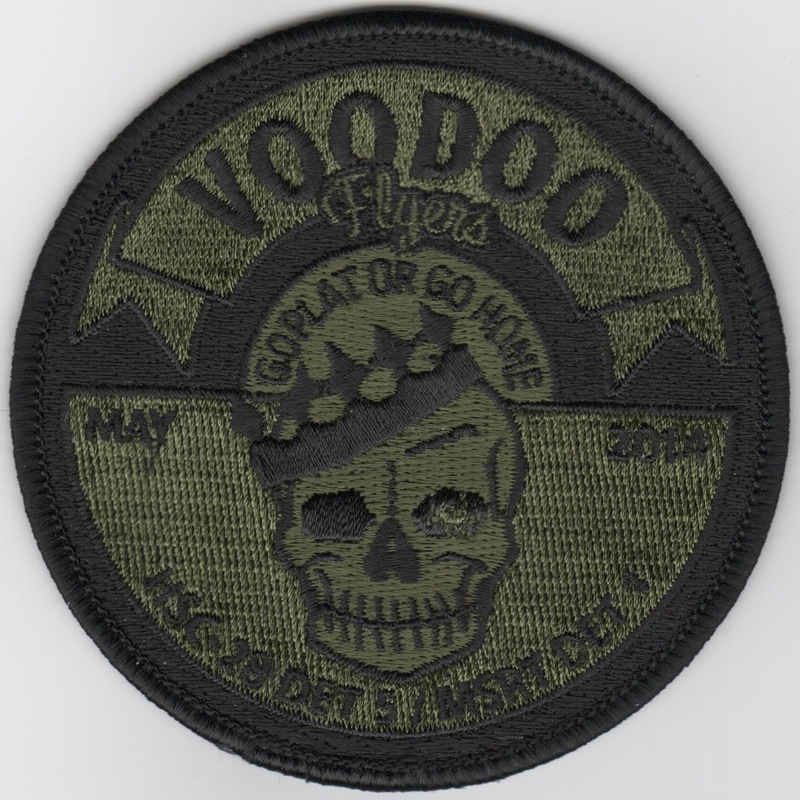 It says "VOODOO FLYERS" across the top, with the date May 2014 in the middle and a skull/crown in the middle. 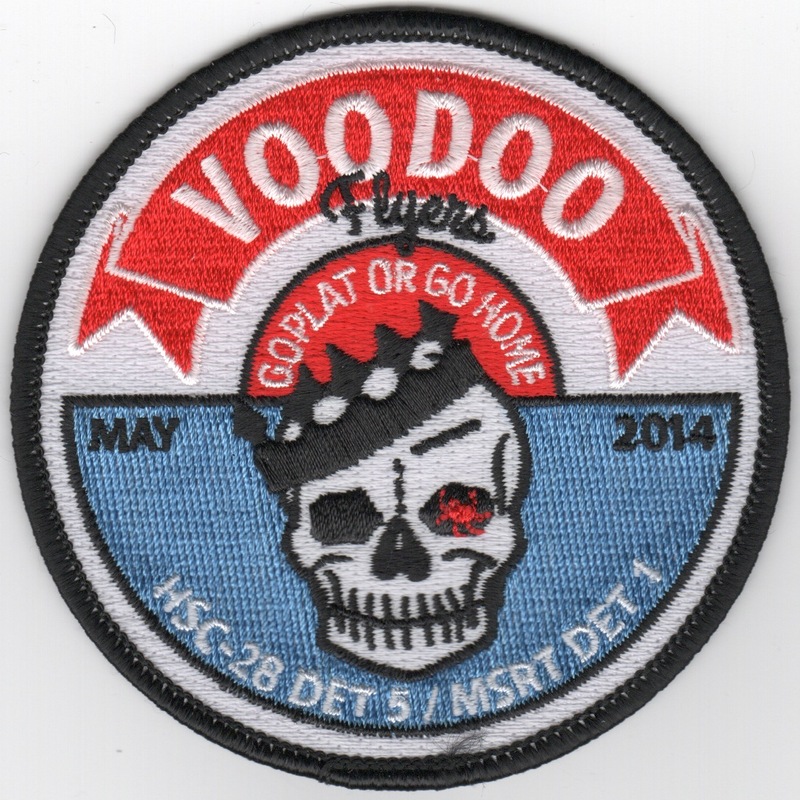 This is 'BUFFALO' version of the detachment patch created for HSC-28, Det-7. 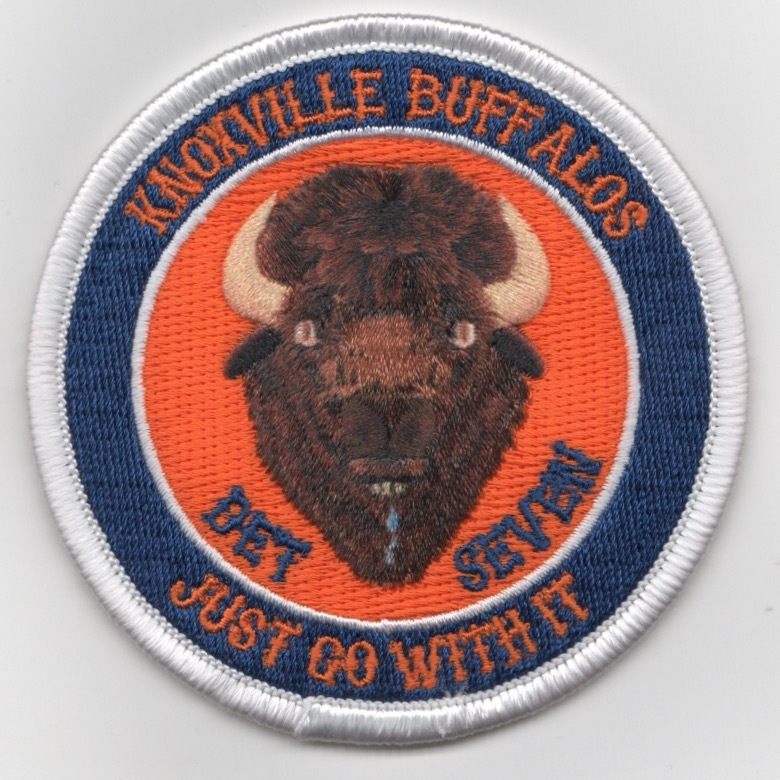 It says "KNOXVILLE BUFFALOS" (top) and "JUST GO WITH IT" (bottom) with a picture of a Buffalo-head. This patch does not come with velcro attached. This is one of the bullet patches for HSC-28. I assume it goes with one of their detachments, but am unsure which. It depicts a "WHITE ARCHER" with the "BLACK OCTOPUS" approaching it. If anyone has any info...... This patch does not have velcro attached. 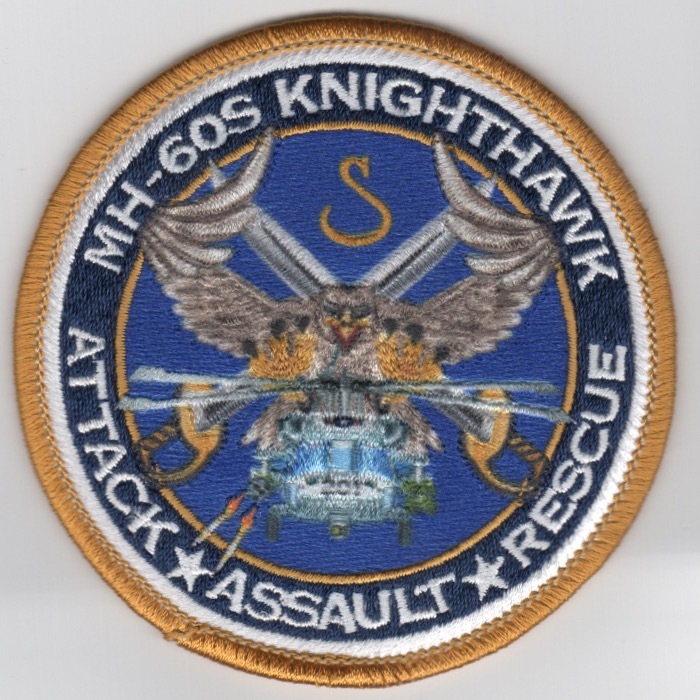 Another AV8RSTUFF creation: This is the EMBROIDERED version of the'gold-bordered' version of the HSC-28 MH-60S 'Knighthawk' patch. It says "ATTACK * ASSAULT * RESCUE" along the bottom and DOES come with velcro attached. 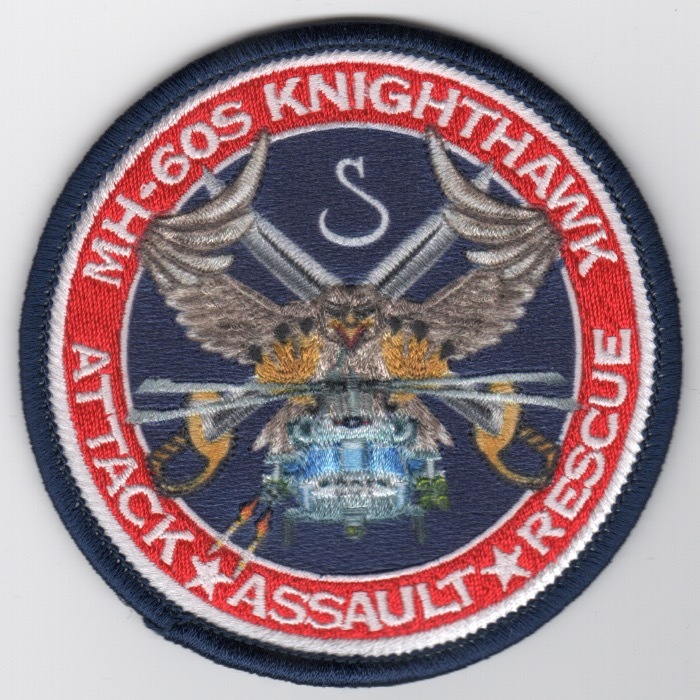 Another AV8RSTUFF creation: This is the EMBROIDERED version of the 'red-bordered' version of the HSC-28 MH-60S 'Knighthawk' patch. It says "ATTACK * ASSAULT * RESCUE" along the bottom and DOES come with velcro attached. 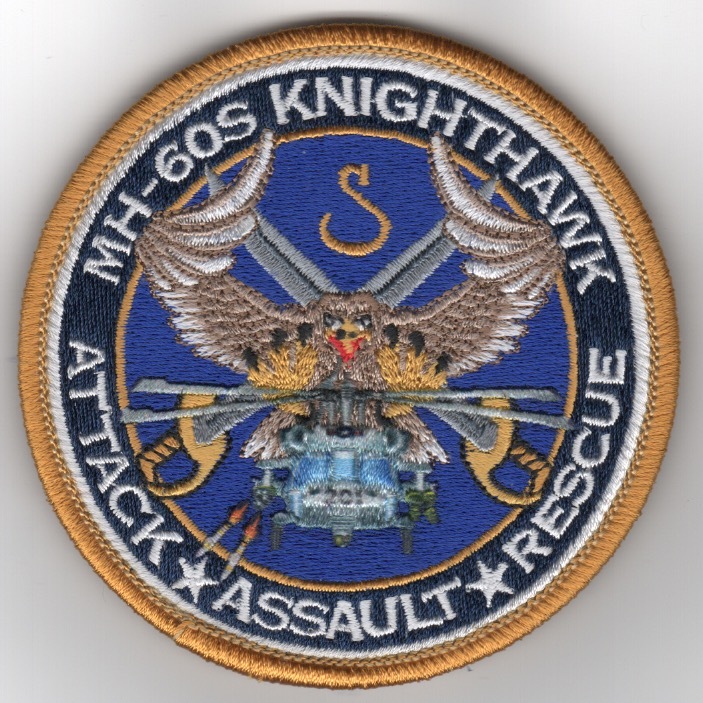 Another AV8RSTUFF creation: This is the SUBLIMATED version of the'gold-bordered' version of the HSC-28 MH-60S 'Knighthawk' patch. It says "ATTACK * ASSAULT * RESCUE" along the bottom and DOES NOT come with velcro attached. 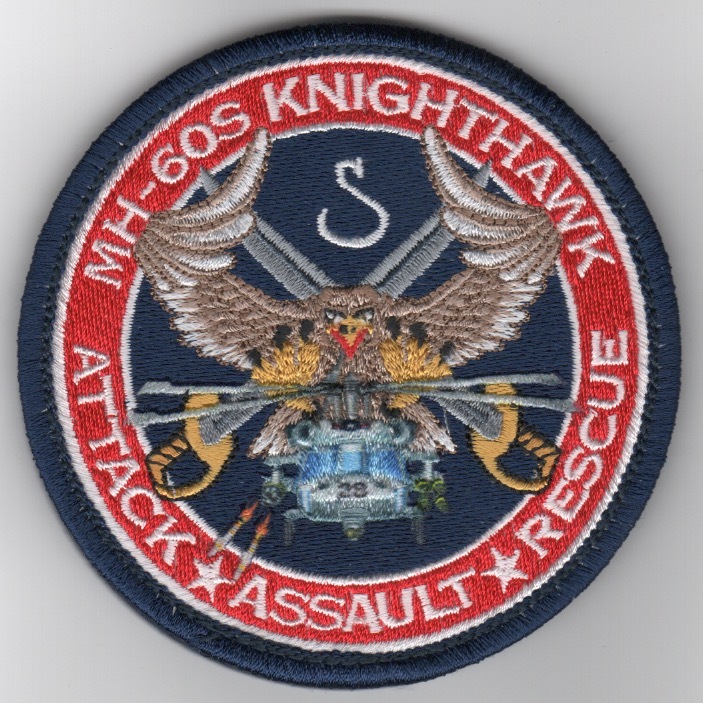 Another AV8RSTUFF creation: This is the SUBLIMATED version of the 'red-bordered' version of the HSC-28 MH-60S 'Knighthawk' patch. It says "ATTACK * ASSAULT * RESCUE" along the bottom and DOES NOT come with velcro attached. 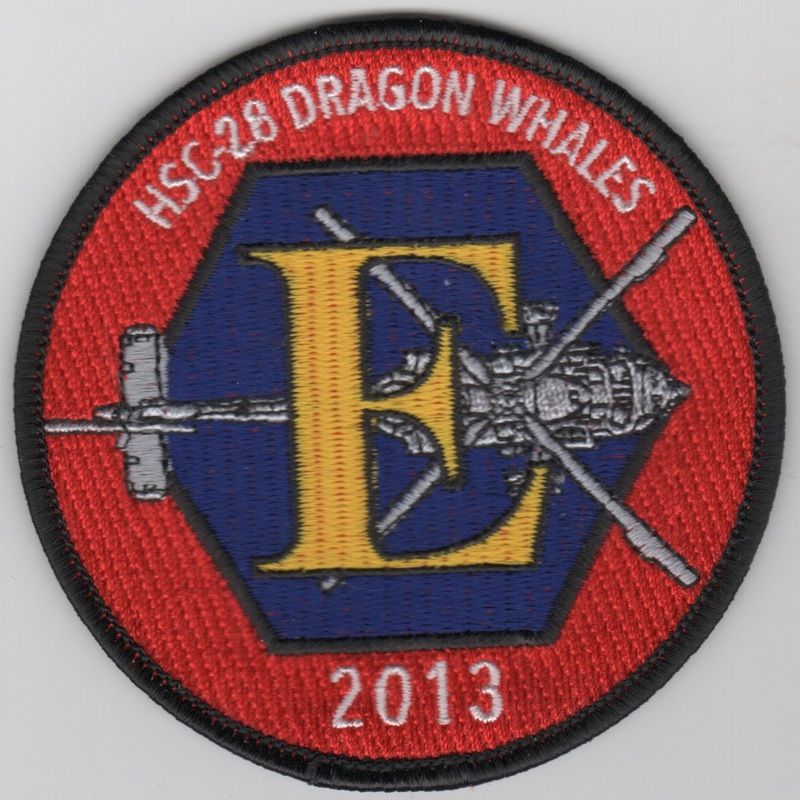 This is 2013 Battle 'E' award patch created for HSC-28 for their efforts in winning this award. This patch does not come with velcro attached. 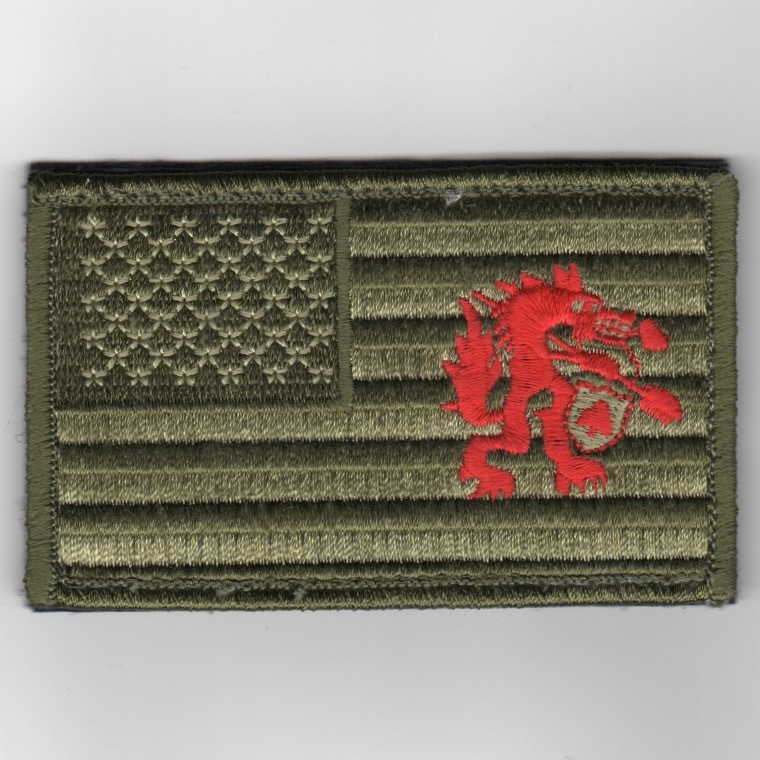 This patch was created to commemorate the winning of the 2011 Battle 'E'. 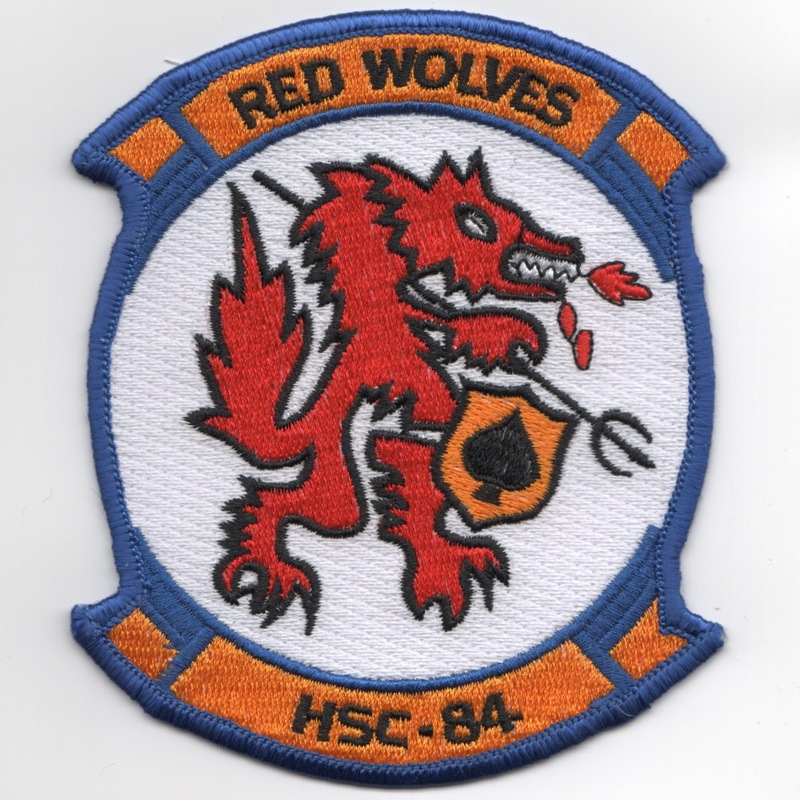 This is the white version of the squadron patch with the 'red dragon' for Helicopter Sea Combat Squadron 84 (HSC-84) "Red Wolves" which is a helicopter squadron of the United States Navy Reserve. Along with the "Firehawks" of HSC-85, the �Red Wolves� are one of only two squadrons in the U.S. Navy dedicated to supporting Navy SEAL and SWCC Teams, and Combat Search & Rescue. They currently operate eight HH-60H Rescue Hawks organized into four independent, two aircraft detachments that can deploy anywhere in the world within 72 hours of notice. No velcro attached. 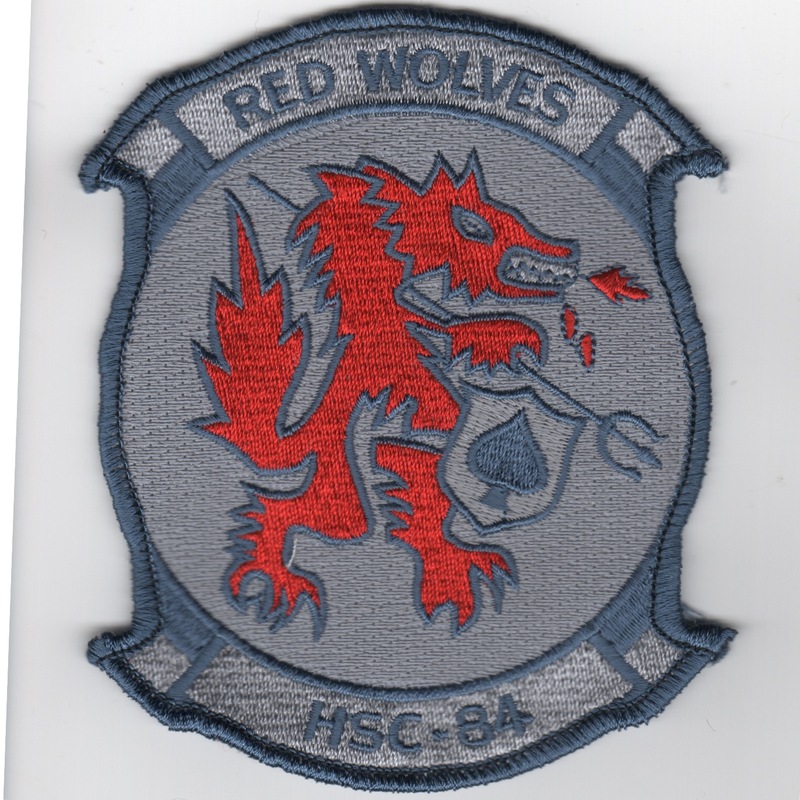 This is the gray version of the squadron patch for Helicopter Sea Combat Squadron 84 (HSC-84) "Red Wolves" which is a helicopter squadron of the United States Navy Reserve. Along with the "Firehawks" of HSC-85, the �Red Wolves� are one of only two squadrons in the U.S. Navy dedicated to supporting Navy SEAL and SWCC Teams, and Combat Search & Rescue. They currently operate eight HH-60H Rescue Hawks organized into four independent, two aircraft detachments that can deploy anywhere in the world within 72 hours of notice. No velcro attached. 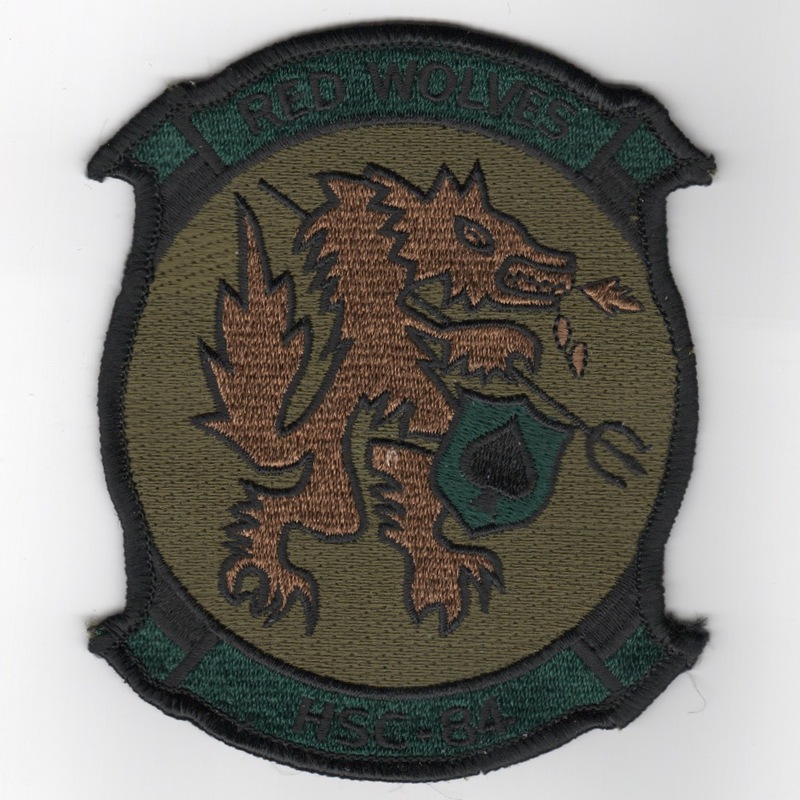 This is the subdued version of the squadron patch for Helicopter Sea Combat Squadron 84 (HSC-84) "Red Wolves" which is a helicopter squadron of the United States Navy Reserve. Along with the "Firehawks" of HSC-85, the �Red Wolves� are one of only two squadrons in the U.S. Navy dedicated to supporting Navy SEAL and SWCC Teams, and Combat Search & Rescue. They currently operate eight HH-60H Rescue Hawks organized into four independent, two aircraft detachments that can deploy anywhere in the world within 72 hours of notice. No velcro attached. 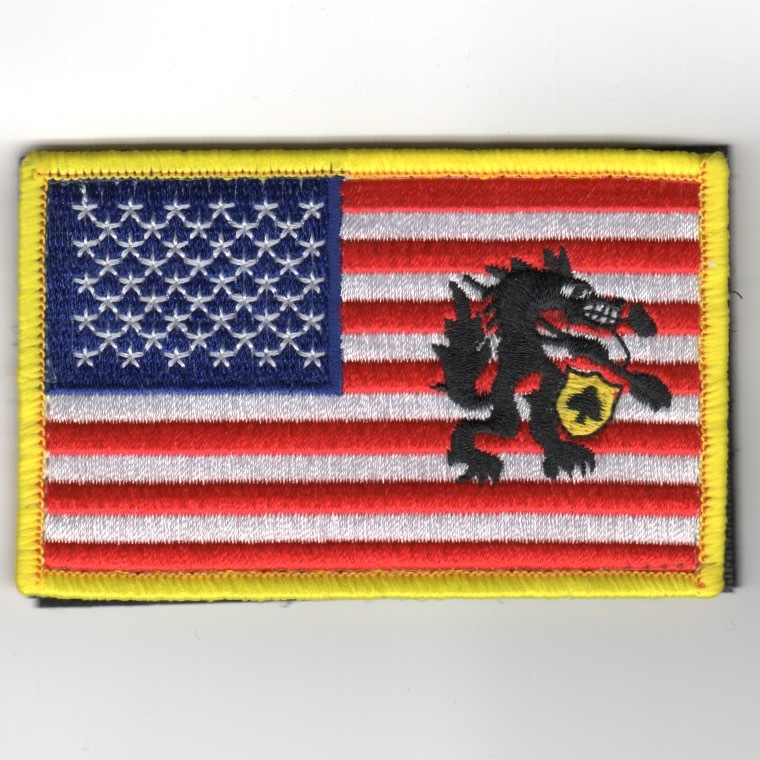 (Another AV8RSTUFF Creation): This is the standard version of the "FLAG" patch with the "Black Lowenbrough Wolf" (since HSC-84 is the "WOLVES") worn on the right sleeve of the flight suit by the operators at HSC-84. This patch already has the velcro attached. (Another AV8RSTUFF Creation): This is the desert version of the "FLAG" patch with the "Black Lowenbrough Wolf" (since HSC-84 is the "WOLVES") worn on the right sleeve of the flight suit by the operators at HSC-84. This patch already has the velcro attached. (Another AV8RSTUFF Creation): This is the subdued OCP version of the "FLAG" patch with the "Black Lowenbrough Wolf" (since HSC-84 is the "WOLVES") worn on the right sleeve of the flight suit by the operators at HSC-84. This patch already has the velcro attached. (Another AV8RSTUFF Creation): Use this link to get the three flags above at a discount. 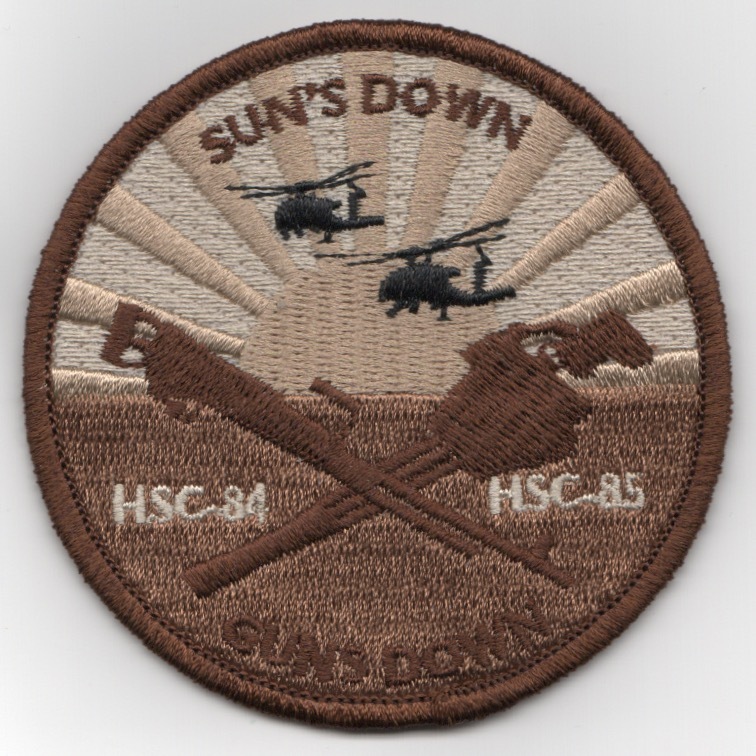 This is the desert version of the joint patch between HSC-84 and HSC-85. It shows "crossed guns" and says "SUN'S DOWN" along the top, "GUN'S DOWN" along the bottom. This patch does not have velcro. 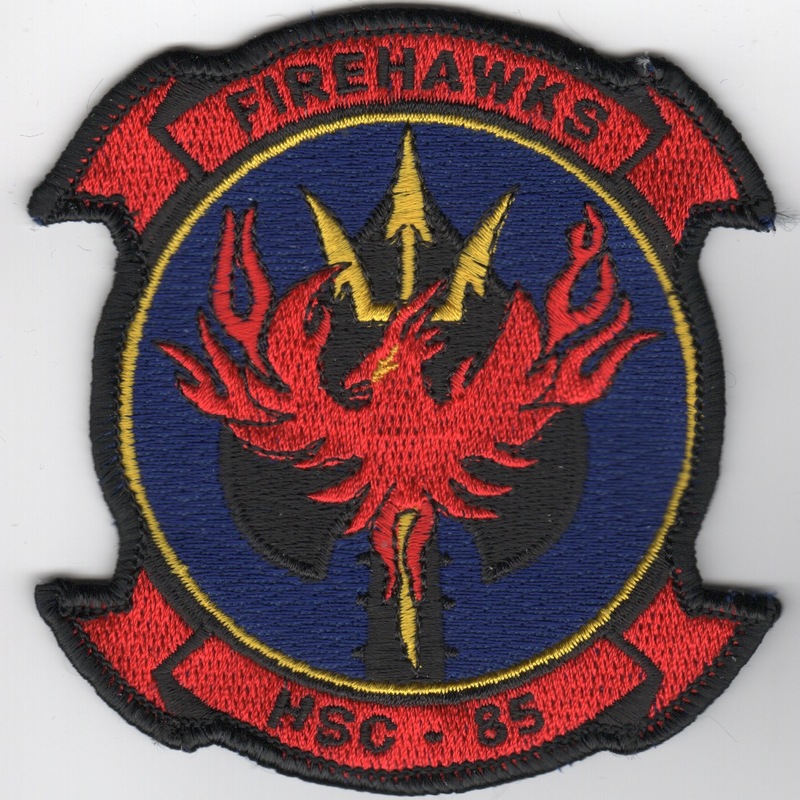 This is the red/blue version the squadron patch for the HSC-85 "Firehawks". Helicopter Sea Combat Squadron 85 (HSC-85) Firehawks is a United States Navy Reserve helicopter squadron based at Naval Air Station North Island, San Diego, California. HSC-85 currently flies the HH-60H Seahawk. This squadron is one of only two Navy helicopter squadrons dedicated to Special Operations support as a primary role. This patch does not have velcro attached. 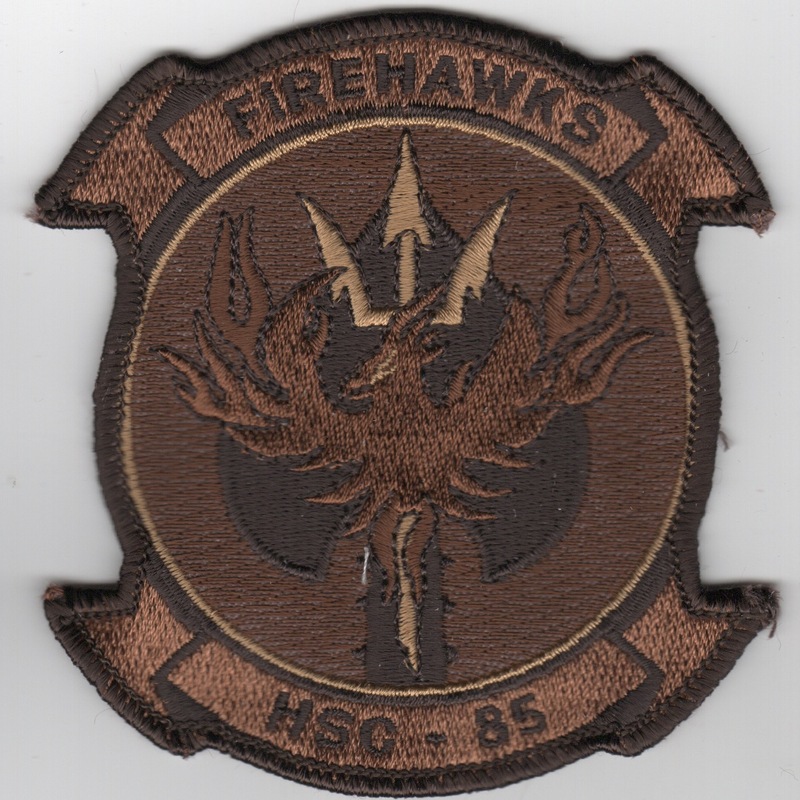 This is the desert version the squadron patch for the HSC-85 "Firehawks". Helicopter Sea Combat Squadron 85 (HSC-85) Firehawks is a United States Navy Reserve helicopter squadron based at Naval Air Station North Island, San Diego, California. HSC-85 currently flies the HH-60H Seahawk. This squadron is one of only two Navy helicopter squadrons dedicated to Special Operations support as a primary role. This patch does not have velcro attached. 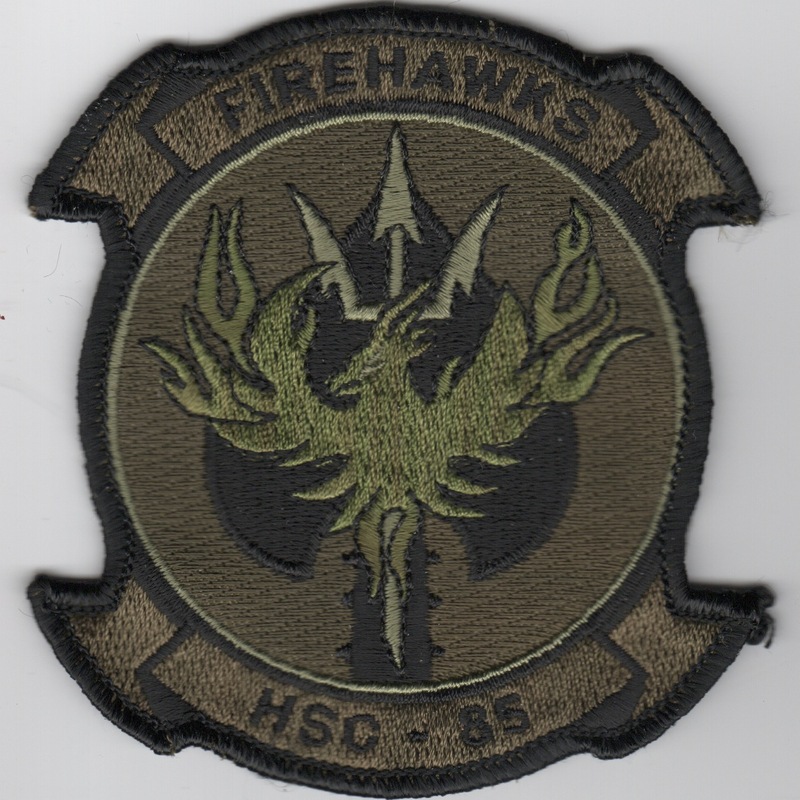 This is the subdued version the squadron patch for the HSC-85 "Firehawks". Helicopter Sea Combat Squadron 85 (HSC-85) Firehawks is a United States Navy Reserve helicopter squadron based at Naval Air Station North Island, San Diego, California. HSC-85 currently flies the HH-60H Seahawk. This squadron is one of only two Navy helicopter squadrons dedicated to Special Operations support as a primary role. This patch does not have velcro attached. This is the subdued version of the new weapons school triangle patch for the HSC community. I don't have all their new info, so anyone that might know, please drop me a line. 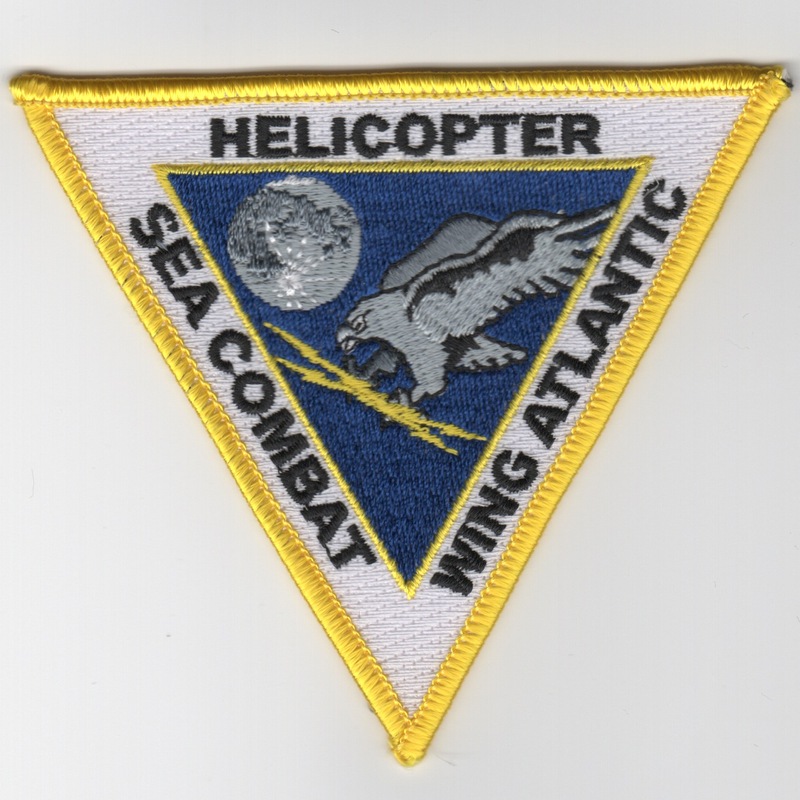 This is the yellow-bordered version of the schoolhouse patch for the Helicopter Sea Combat Wing, Atlantic. 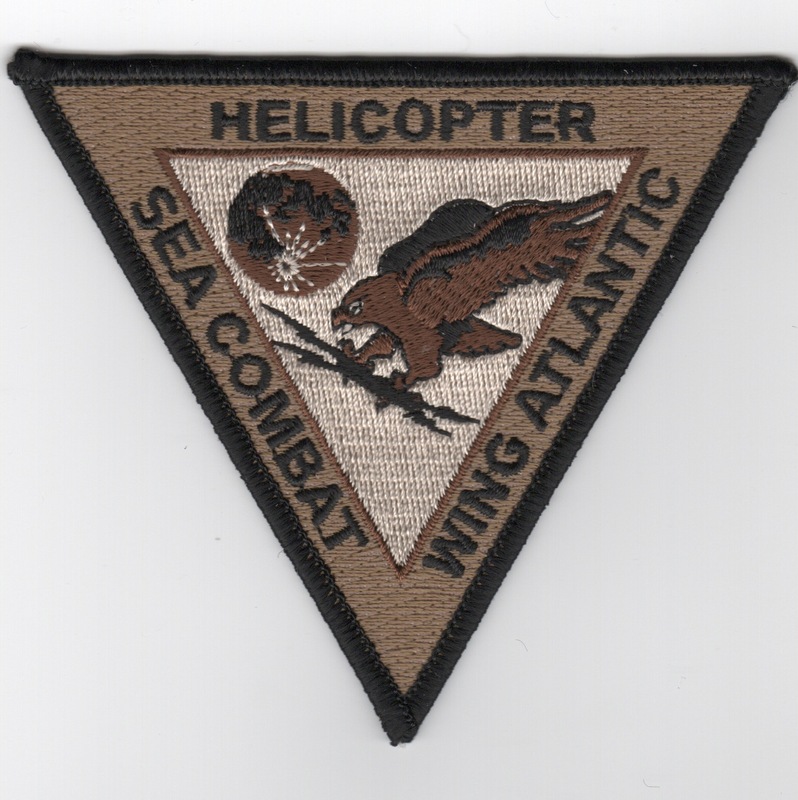 This is the desert version of the schoolhouse patch for the Helicopter Sea Combat Wing, Atlantic. 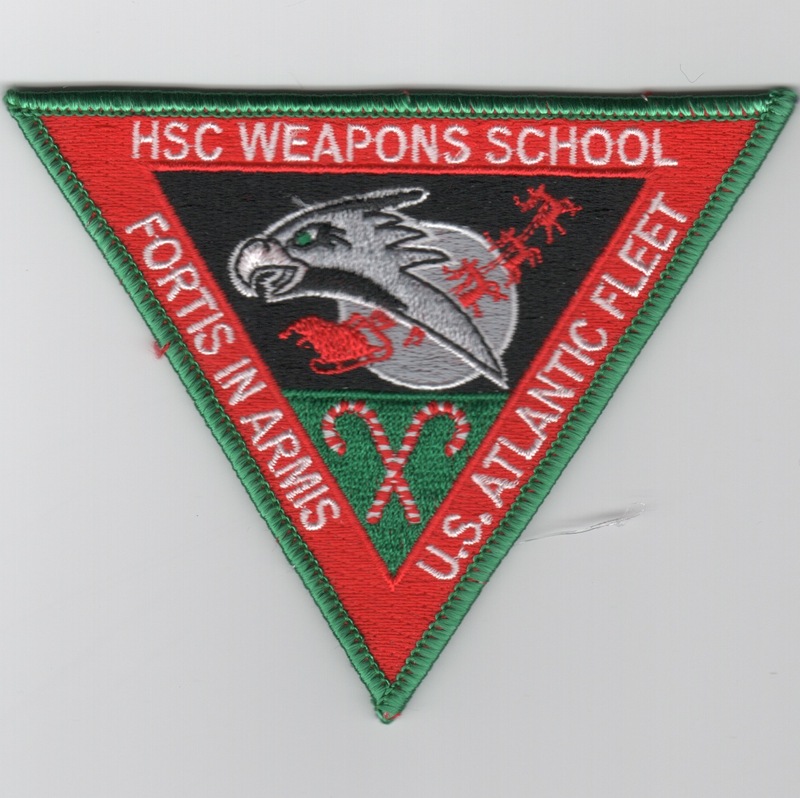 This is the subdued version of the HSC Weapons School patch for the US Atlantic Fleet and says "FORTIS IN ARMIS". This is the "Christmas" version of the new weapons school triangle patch for the HSC community. I don't have all their new info, so anyone that might know, please drop me a line.